The international community intervened in 2015 to solve the problem by brokering a power sharing agreement between rival parties and factions which was signed in Skhirat Morocco. This agreement led to more divisions by adding new political bodies, including the so-called Presidential Council and its government of national accord , and the Supreme Council of State which would share power with the elected parliament . This agreement failed to solve the problem because of UNSMIL's focus solely on the political track and neglecting the security track, although the agreement explicitly has clauses for the disarmament of militias and the activation of security and military institutions. This situation is ongoing and things are deteriorating . Libyans are suffering due to high prices, lack of cash in banks, the devaluation of the Libyan Dinar , the frequent electricity blackouts which reaches more than 10 hours a day and Fuel shortages ,to make matters worse the crime rate dramatically escalated (killings , kidnaping, burglary , armed robbery and human trafficking ) this is due to the security vacuum. In an unprecedented move the militias are now in control of sovereign institutions including the central bank and they are holding the presidential council hostage to their agendas .and this is confirmed by some international reports. This unique situation will make it extremely difficult to form any government and thus block the establishment of the state because Tripoli is its center. In order to solve this dilemma parliamentary and presidential elections should be held as soon as possible to eliminate the rival bodies, that have exceeded their legal terms especially as they did not make any serious effort on how to stabilize the country and unify the state institutions as per the Skhirat agreement despite the passage of nearly three years . It's continuation has complicated the political scene . There are parties which do not want elections to be held to prolong their lives. There excuse and justification is that there is no constitution and that there has to be a referendum on the constitution before the elections. However opinions are largely divided vis a vi the draft constitution. There is no chance of Libyans agreeing on the draft constitution and thus prolonging the crisis. 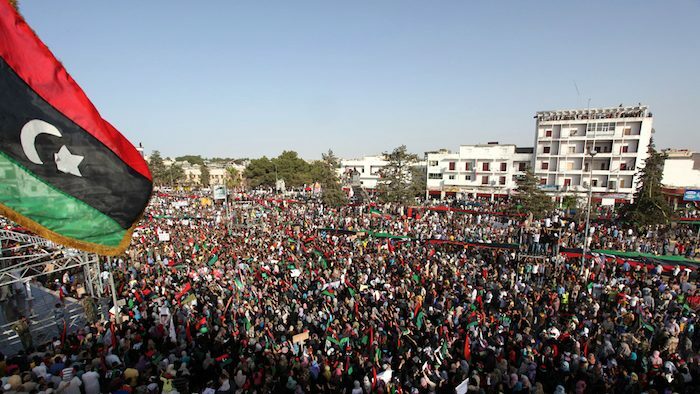 The constitutional declaration and its amendments can be a constitutional basis for elections as any delay in holding it will expose Libya to the risk of division that looms in the horizon. This is what Dr. Saif al-Islam Gaddafi en visions for libya , and he believes that a peaceful solution is the only path to resolving differences without resorting to the use force ,and that the armed forces must be unified and subordinated to civil authority . He also supports the establishment of a civil state where all citizens have equal rights under the rule of law and the peaceful transfer of power democratically , and one of his priorities is national reconciliation. Dr. Saif al-Islam Gaddafi is best suited to lead this reconciliation process because of his reputation and experience in reconciliation (before 2011). He succeeded in reconciling with most of the opposition to the former regime . He was also instrumental in the release of all political prisoners . A very important factor is that he is the “Guardian of Blood” as his father and brothers were killed during the 2011 conflict . Dr. Saif al-Islam Gaddafi was instrumental in resolving disputes between Libya and the West which resulted in its reintegration with the international community after being isolated for decades. Among his priorities is combating terrorism and combating illegal immigration, Libyans did not forget his role as a reformist before 2011. He he was a claimant to the Constitution, which was actually was drafted in 2009, and thanks to his efforts several laws were and decrees were implemented to strengthen freedoms in general and the freedom of the press in particular, and led a comprehensive development program not seen in Libya! The signing of contracts worth more than $ 125 billion that were awarded international companies, but unfortunately stopped in 2011 due to the exit of international companies because of the security chaos and mismanagement by the new rulers and political division and mismanagement of financial resources, so the resumption of this development program is an urgent necessity to improve the welfare of all Libyans. This can only be achieved by creating a safe security environment for the companies to resume their work again, and it goes without saying that companies whose countries helped us throughout the crisis will be given a priority in the reconstruction program noting that the projects will be in all sectors, including oil and gas sector. Dr. Saif al-Islam Gaddafi enjoys great popular support from the youth who are the majority of the population and most of the large Libyan tribes that support the former regime still look up to Saif al-Islam Gaddafi as the savior of the country. Libyans, after more than 7 years witnessed danger threatening their lives and their suffering increased which led to some of them trying to flee the country to reach Europe with illegal immigrants in boats and putting their lives at risk in the hope of a prosperous life overseas. All of these people will support him as their candidate in the upcoming elections. Dr. Saif al-Islam Gaddafi was tried in Libya and was pardoned by the law of general amnesty issued by the legislative authority (parliament). However, there are some restrictions on his movement and his contacts with others due to the security situation. Expediting parliamentary and presidential elections in accordance with the Constitutional Declaration and its amendments. The international community should supervise and observe the elections to guarantee its fairness , integrity and transparency and to curb corrupt campaign financing and intimidation of candidates and voters by militias . Guarantee that no Libyan is excluded from running for office or voting . Technical assistance in disarming and dissolving militias in Tripoli. This is crucial for peace and stability .